Stevinson Ranch, already breaking ground as the nation's first course believed to be run primarily on solar power, now jumps to the top with its learning center, opened recently. The center is split into three bays — the first for fitness, the second for club-fitting and the third for all that well-recorded swing analysis. Students will graduate from one to the next because they are connected. 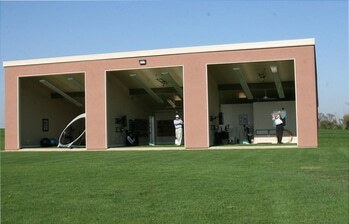 Located at the opposite end of Stevinson's practice range, the building redefines golf instruction in the area. One of the trendiest devices is FlightScope's wireless unit, a serious upgrade to the standard-issue golf launch monitor. It measures everything — clubhead speed, ball-spin rate, ballspeed, launch angle, clubhead position at impact, carry distance and total distance. From those numbers produce ideal club-fitting and more precise lessons. After all, there are no more secrets "If you are fitted properly, it's amazing the difference it makes for both the accomplished player and the average player," said George Kelley, the Stevinson Ranch owner. "You're much better off than just buying something off the rack somewhere." Kelley went all-in on instruction when he learned that the top 10 percent of American golfers spend 50 percent of their golf money on equipment or lessons. Simply, the owner is trying to maximize his facility. Stevinson Ranch, located south of Hilmar, may be off the beaten path, but it promises and delivers top-tier service for serious players.